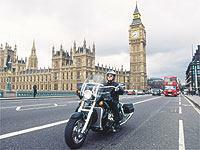 Motorcycling seems to be showing a rise in popularity at the House of Commons according to a recent survey by the Motorcycle Industry Association (MCI). The survey asked a panel of 146 MPs about their attitudes to motorcycling and came away with a very positive picture that could effect the governments upcoming National Motorcycle Strategy, due to be published in 2004. MPs were given four statements and asked to say how strongly they agreed or disagreed. When asked if they thought bikes are a good way to avoid traffic congestion an overwhelming 83 per cent agreed with just 10 per cent disagreeing. A shift towards allowing bikes to use bus lanes was hinted at when the MPs were asked if they thought that allowing bikes to use them would make the bikes more visible to other drivers and pedestrians. 64 per cent agreed, up five per cent on the response to the same question asked in 2000, while those that disagreed fell by a massive 12 per cent. 47 per cent of those questioned believed there was a lack of motorcycle facilities in their constituencies, up seven per cent on 2000, but the number that didn’t agree fell by two per cent. Only 33 per cent agreed that bikes should be exempt from road user and workplace charges such as parking levies, but that represents an increase of six per cent, while those that thought bikes should still be charged fell by a massive 15 per cent. Craig Carey-Clinch, MCI Director of Public Affairs, said: " These results show that more and more MPs think more needs to be done for biking in their constituencies. They also show how out of step transport planners are with parliamentary opinion if they continue to ignore motorcycling as an alternative to the car. " To comment on this story click the link on the right to go to our News discussion board.